About "KJV Thinline Reference Bible Chestnut Brown"
The Word of God is a sacred gift. It's compelling, life changing, and inspired-sharper than any sword and a sustaining comfort to any heart. 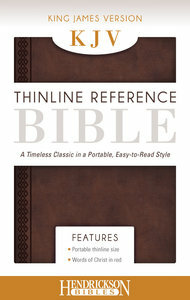 Now you can carry the Scriptures with you in this portable thinline edition-a treasured companion on your journey of faith. Let the magnificent language of the King James Version-which has stood the test of time for over 400 years-stand firm in your heart.